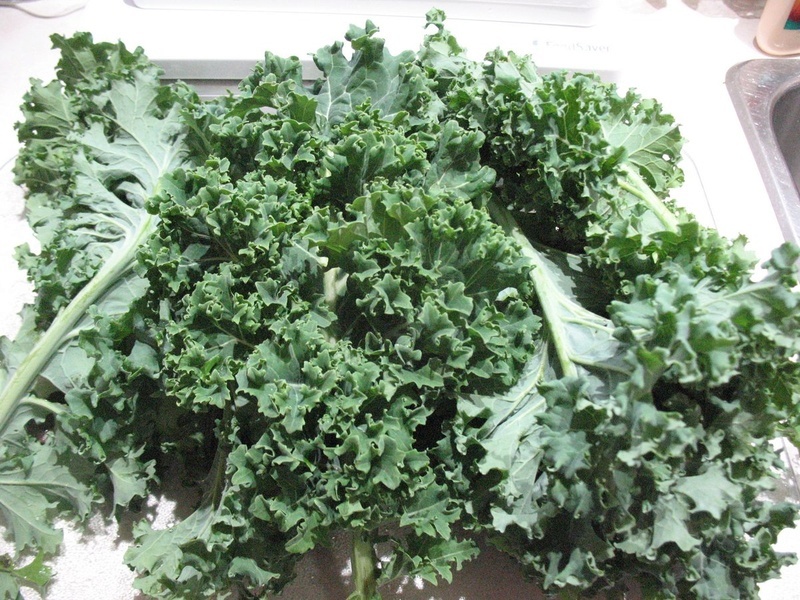 Things continue to wind down and in anticipation of the cleanup of the SFG beds I harvested some kale and prepared it for freezing. 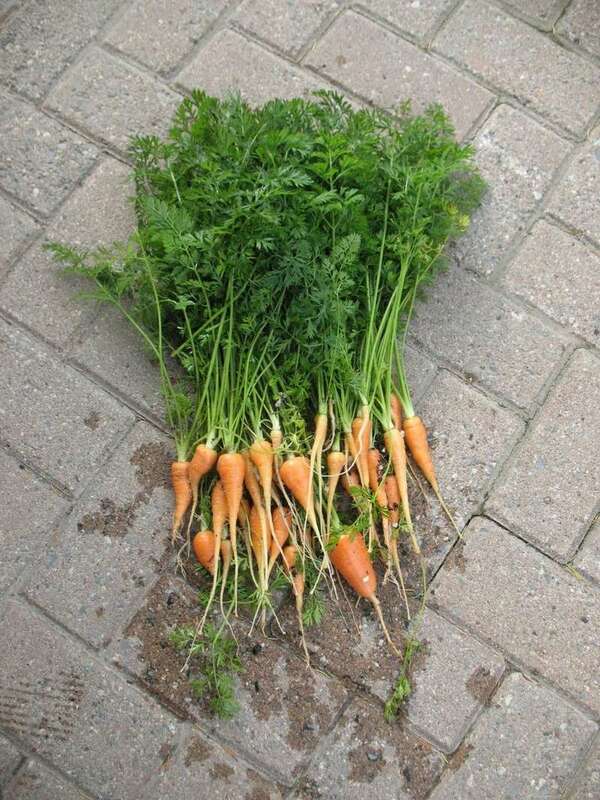 It will be used in green smoothies. What the SFG currently looks like after several days of rain, rain, rain including today. This lonely Kale plant in this ANSFG bed got harvested today. 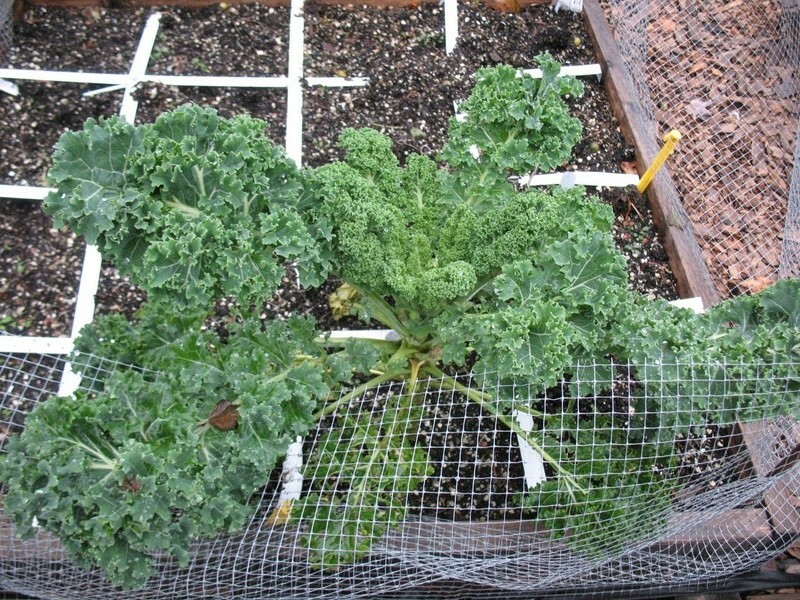 Some of the Kale in this ANSFG bed also got harvested. I plan on doing the same with the Swiss Chard in the next few days. 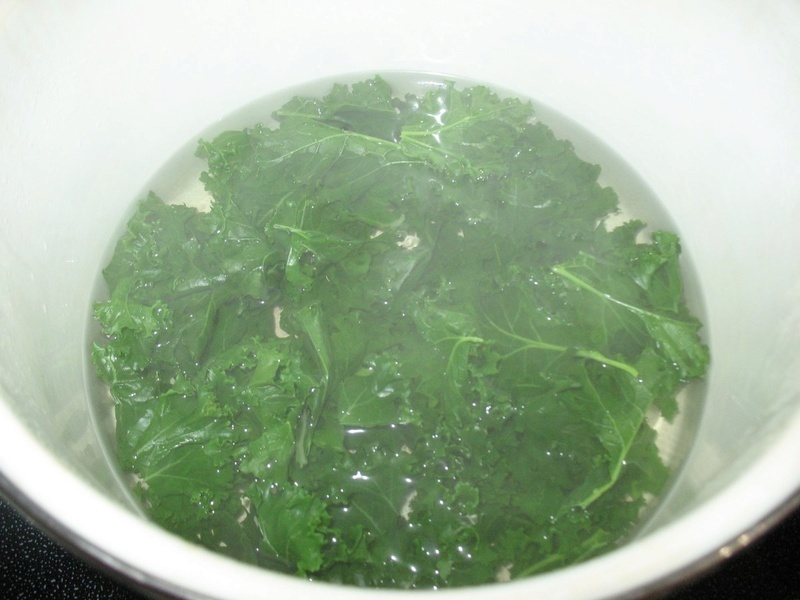 The Kale from the first plant. Some was slug damaged and went to the compost pile. Some of the harvested Kale ready for washing and tearing into smaller pieces. Into boiling water for 2 minutes then into a pot of cold water with ice cubes. 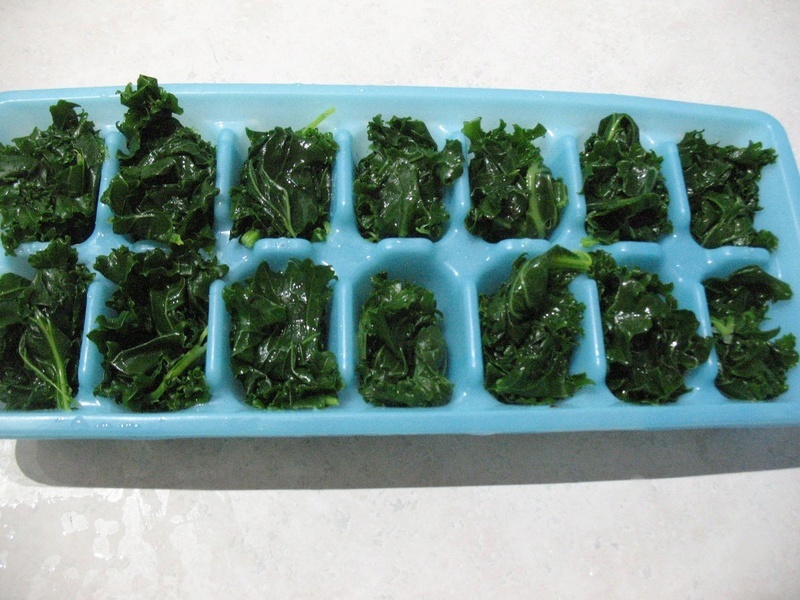 I put the processed Kale into ice cube trays. 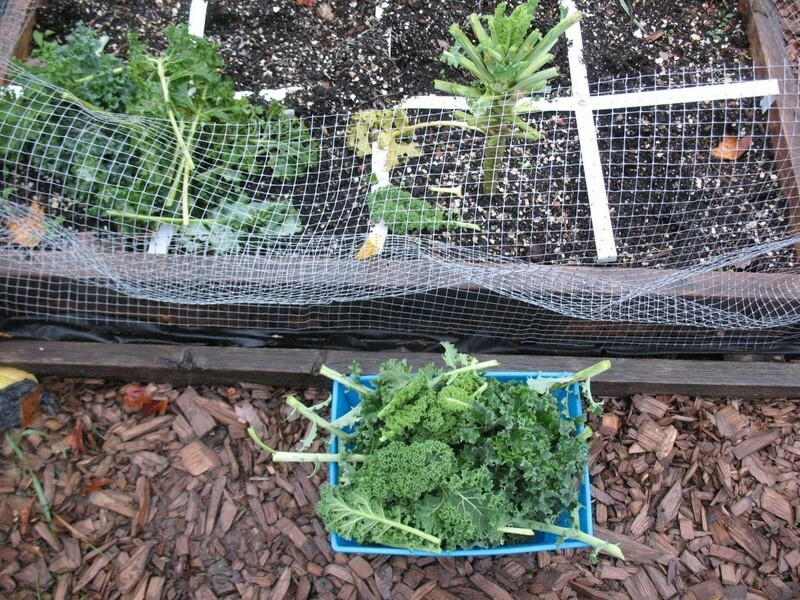 When frozen I will transfer the Kale cubes into freezer bags. 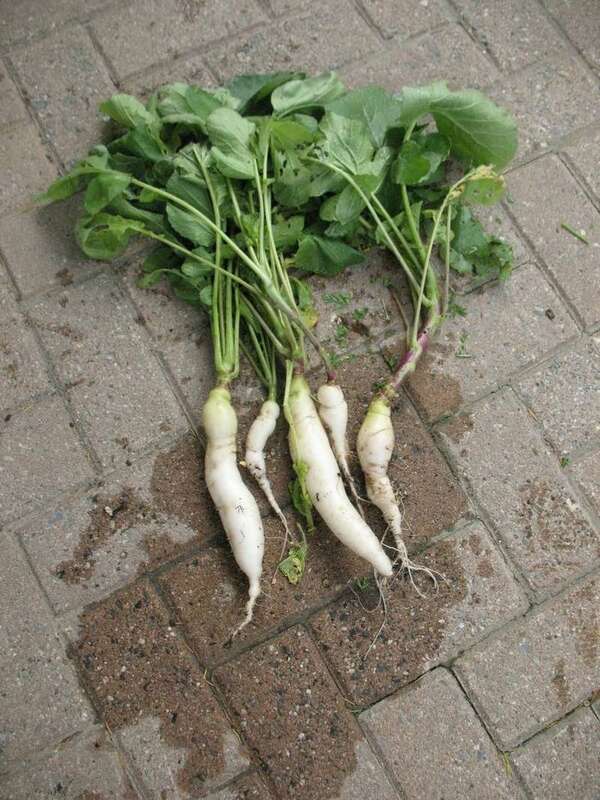 Continuing my very slow cleanup of the SFG beds I pulled some small carrots and big icicle radishes. 1. Cut the plants back and removed satellite plants. 2. Added some homemade compost. 3. 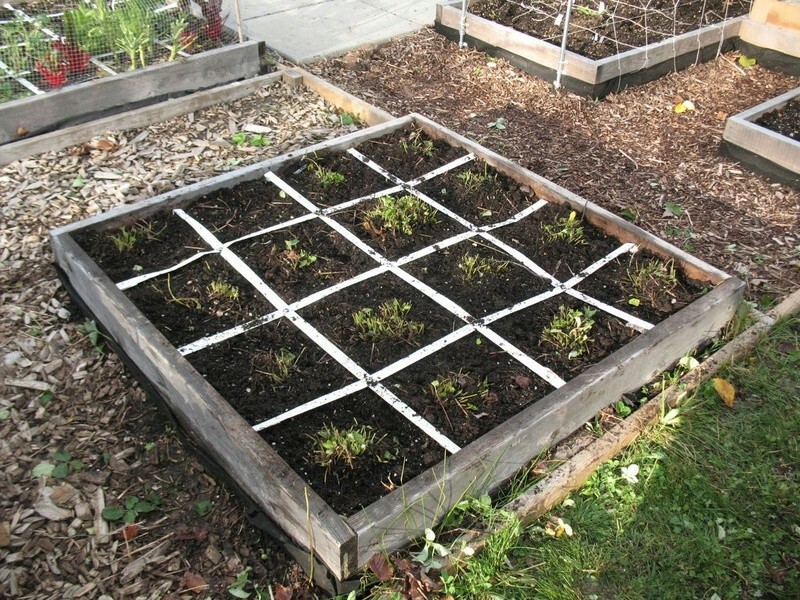 Put in place a cardboard perimeter "wall". 4. 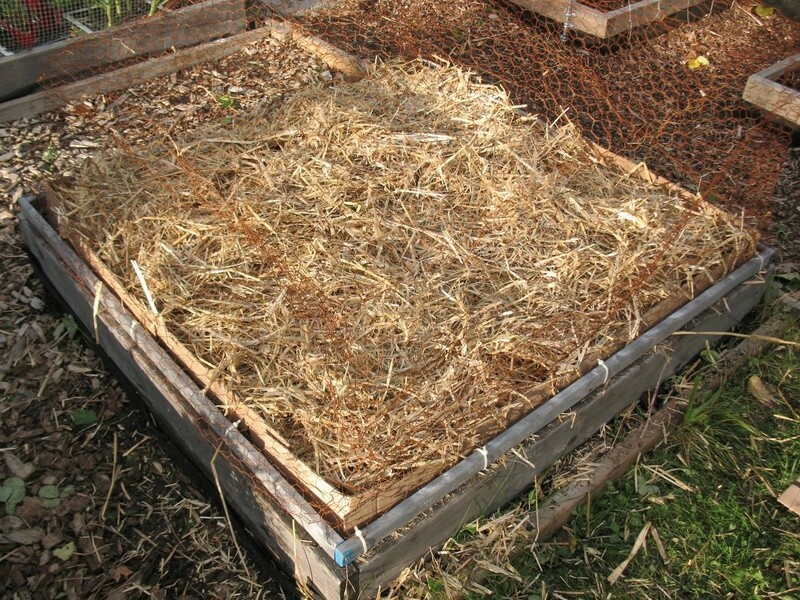 Filled the bed with straw. 5. 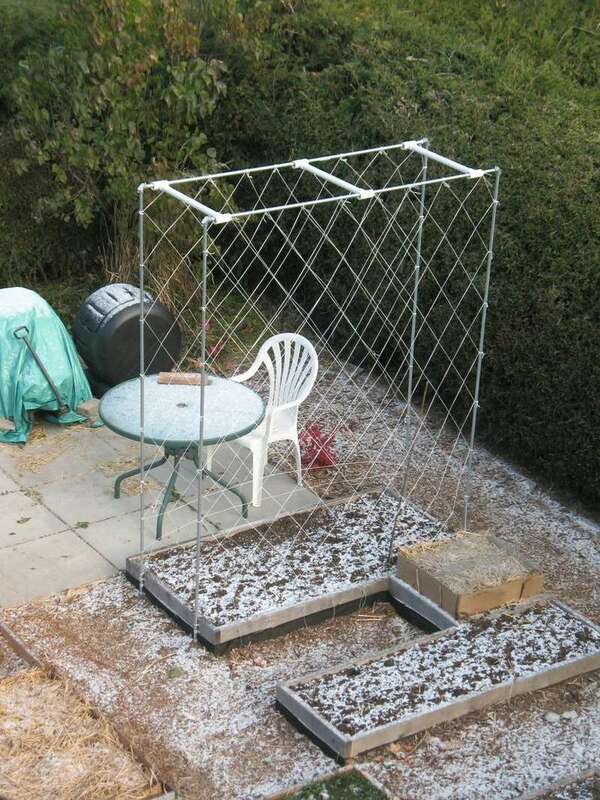 Put the rusted chicken wire cage over the bed to keep out the squirrels, etc. I left a Winter Sowing container from last Winter/Spring on top of one of the old style SFG beds. 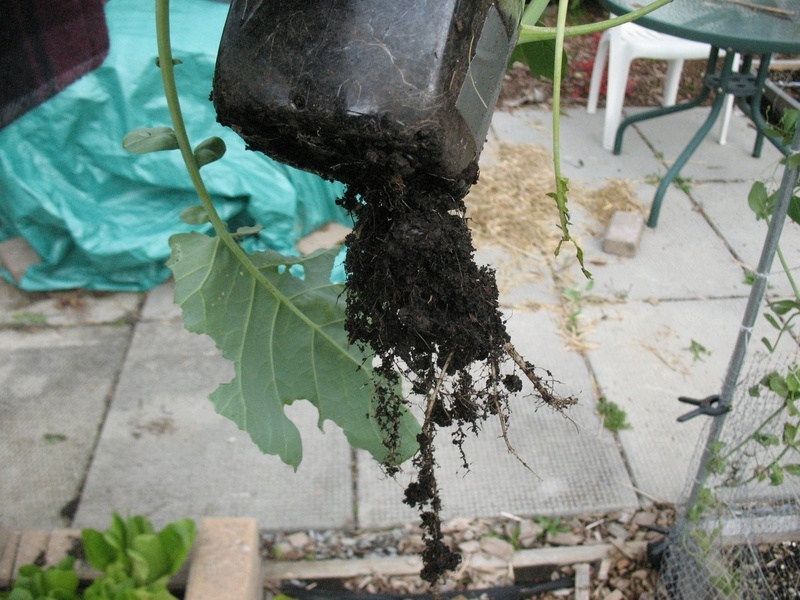 The kohlrabi that were sown in the container grew and the roots went though the holes in the bottom of the container and down into the bed. This is what I found today. Wow! That kohlrabi wants to LIVE! You can eat the leaves, you know. Great idea with the kale. How many cubes per smoothie? @CapeCoddess wrote: Wow! That kohlrabi wants to LIVE! You can eat the leaves, you know. 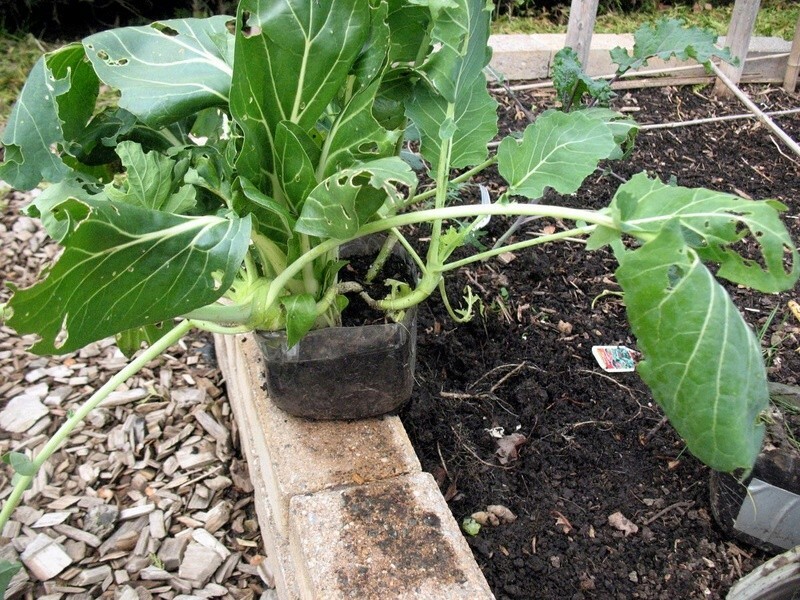 CC, the Kohlrabi leaves look like they have been used as the main menu at a snack bar for slugs! I've only tried one smoothie with the kale cubes and I used three of them. I added in some frozen cucumber, a frozen banana and three regular ice cubes. It actually made a little but too much. One thing I did find out is that the Vitamix was not too happy with all that ice and I had to use the plastic plunger several times to keep things turning. In the end I got something that resembled green ice cream that could be eaten with a spoon. 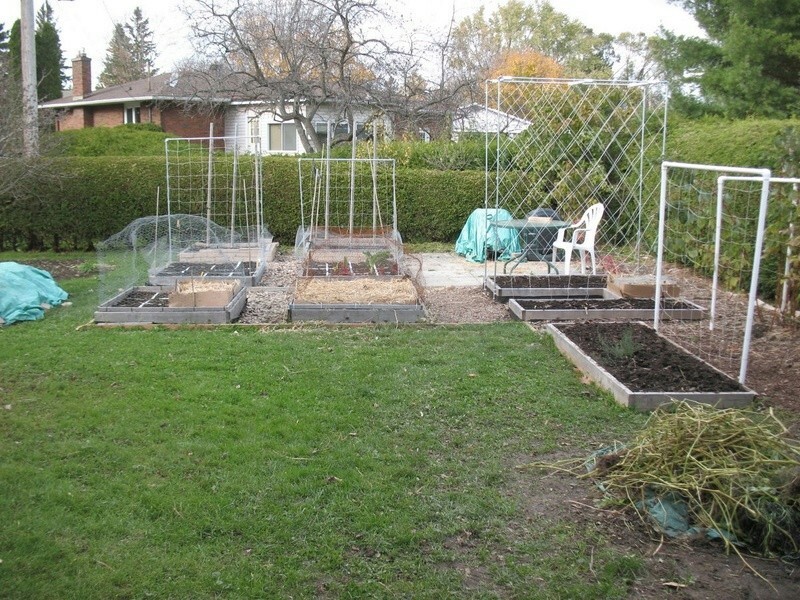 Today I completed the cleanup of the ANSFG beds (including the table top), OSFG beds and soil beds. 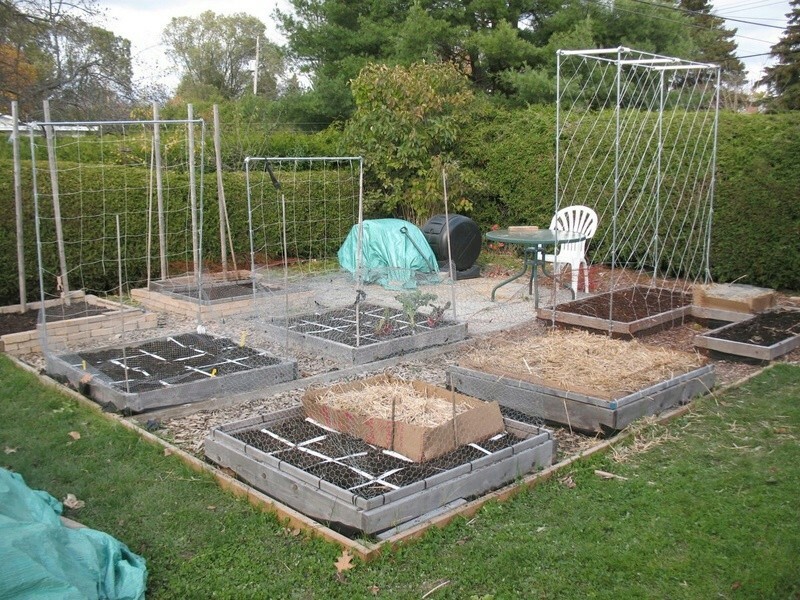 Also added compost to all veggie beds. 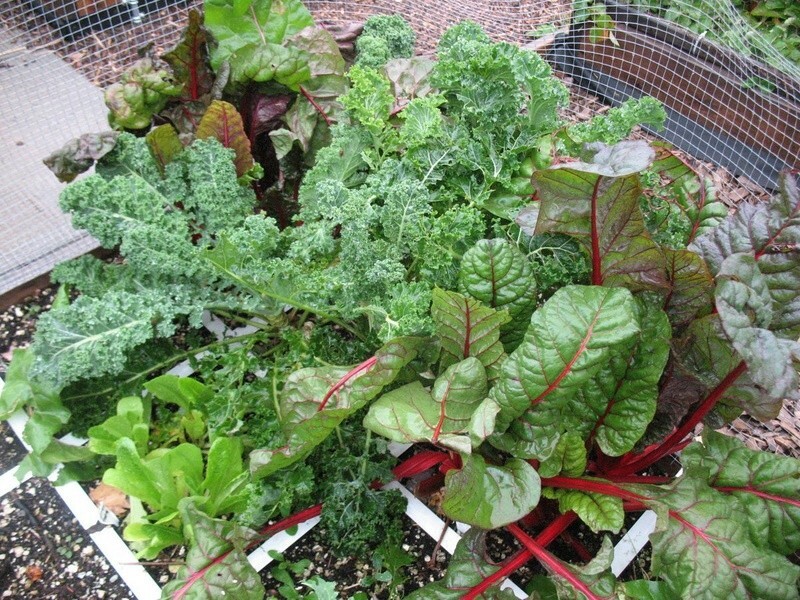 I still have some kale and chard "growing" in one of the ANSFG beds. I've got a couple of bags of leaves to mulch up for one of the the compost bins. Tomorrow morning is trash/garbage pickup and I expect there are lots of bags of leaves set out at the end of people's driveways. I could use more leaves but I don't have the energy to patrol the neighborhood and grab bags of leaves. Last Fall I had a whole bunch of bags of leaves that I stored over the winter to use in the Spring and Summer compost bins. Mrs TD was not too happy with the long term storage situation. 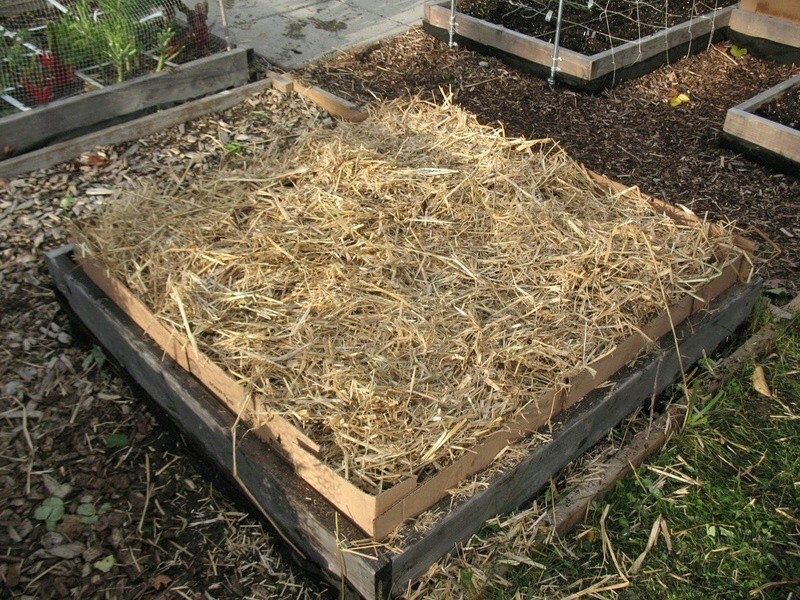 TD, How are the 2 new compost piles doing? @sanderson wrote: TD, How are the 2 new compost piles doing? The irregular shaped hardware cloth bin that was recently filled is cooking at about 120F. That's not bad considering the ambient temperatures have been quite low. I have not even checked the 3x3x3 lately. As for the 3x6x3 pile built on the ground, I've not done anything with it either. The height has decreased as expected. I'm just going to let the piles do their thing and see what I get next Spring. At that time I'll screen the contents of the hardware cloth and 3x3x3 bins. I'll just let the 3x6x3 continue on without screening. For today (November 8th) I planned to cleanup the goldfish garden pond. For fun, I thought I would check back on my 2016 thread to see if I noted this cleanup last year. And guess what? It was doen exactly on November 8th. Here is last year's post. First thing I did today was cleanup the pond. 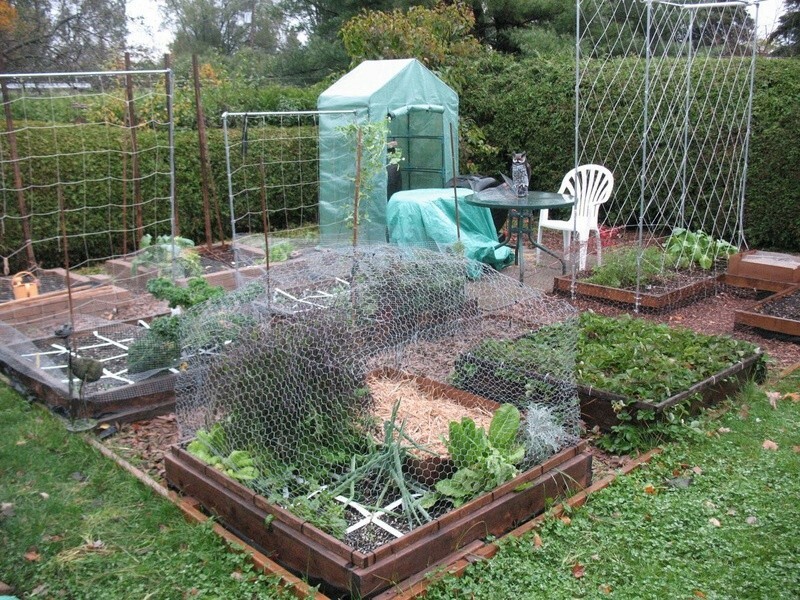 I took out the plants, trimmed tops and roots, used what I took off for composting. In the photo you cans see some of the plants (mainly water lilies) on the left. The roots were huge and covered in green slime/algae. I got the pond cleaned up which includes trimming the tops and roots of the water lilies. This material went into the hardware cloth compost bin along with some more garden waste and kitchen scraps. 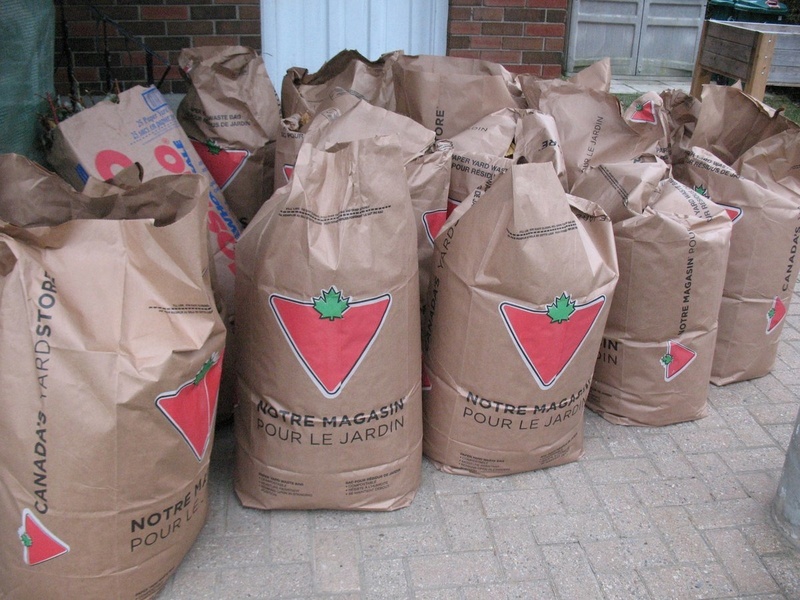 I also had almost three full bags of leaves which I mulched up and added to that compost bin. 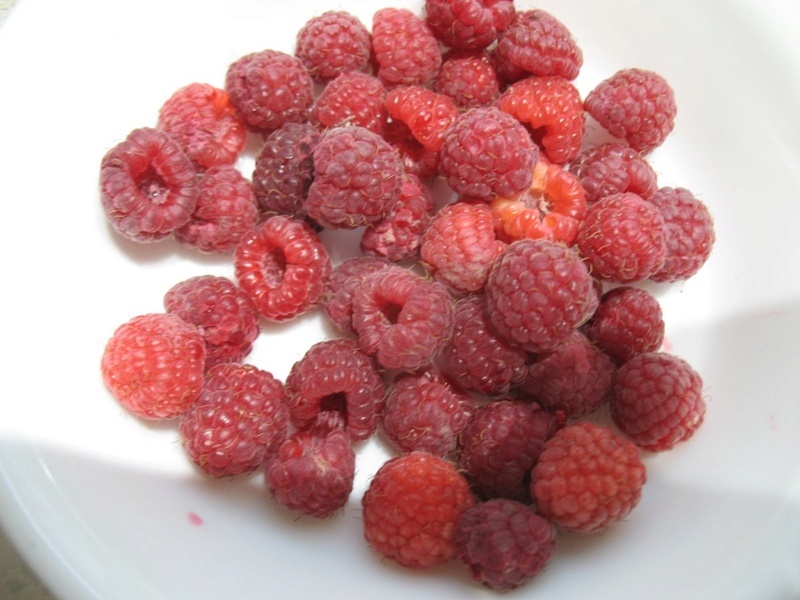 Mrs TD harvested the last of the Raspberries before she trimmed back the canes. A very light scattering of snow on the SFG on a bitterly cold (-10C) and windy November 10th morning. You could have warned us, TD. That kind of temp drop could shock our systems this early in the morning. @trolleydriver wrote: A very light scattering of snow on the SFG on a bitterly cold (-10C) and windy November 10th morning. @countrynaturals wrote: You could have warned us, TD. That kind of temp drop could shock our systems this early in the morning. Today I scored a dozen bags of leaves from a neighbor down the street. He was kind enough to deliver them to my house with his pickup truck. 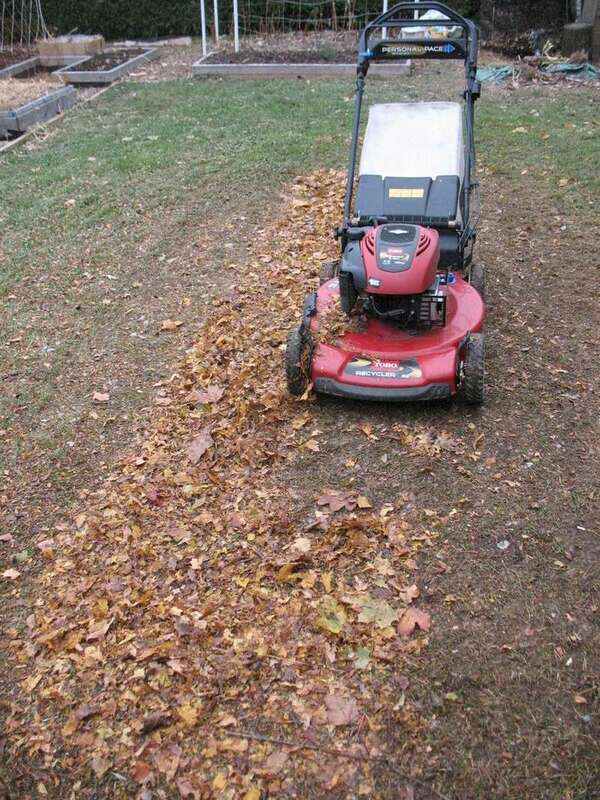 If I can get my lawnmower started in this cold weather, I will mulch the leaves in order to reduce the volume for over the winter storage. If that happens then I will pick up more leaves from that same neighbor. My compost bins have already been filled but I could top them up with some of the mulched leaves, coffee grounds (local coffee shop) and kitchen scraps. 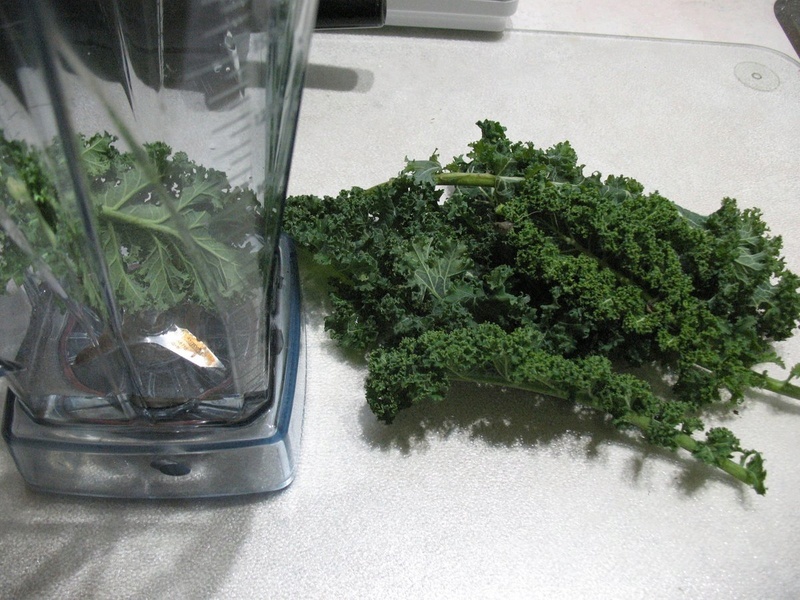 Harvested the last of the Kale from the ANSFG and used it in a green smoothie. I thought I got 12 bags of leaves from the neighbor but there are actually 15 bags. 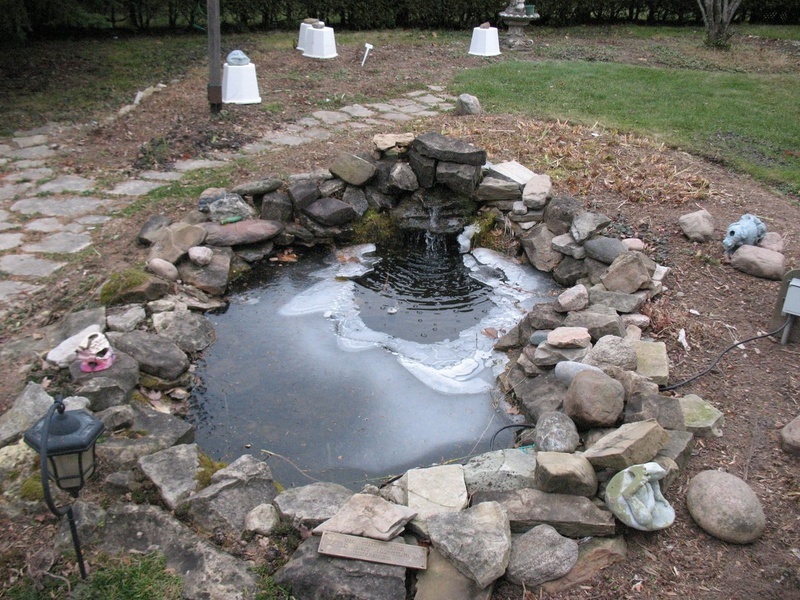 The goldfish pond is starting to freeze over. The waterfall is keeping part of it open. Mulched the last of the leaves for this year. I do one bag at a time. 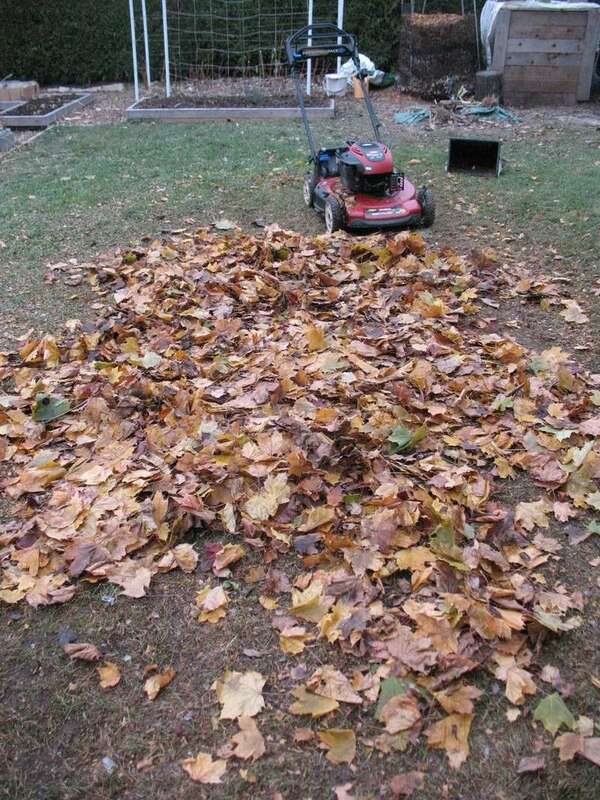 I spread the leaves out on the lawn and make a first pass with the mulching mower with the door to the collection bag closed. I make a second pass to give them another mulching but with the door to the bag open to collect the results. 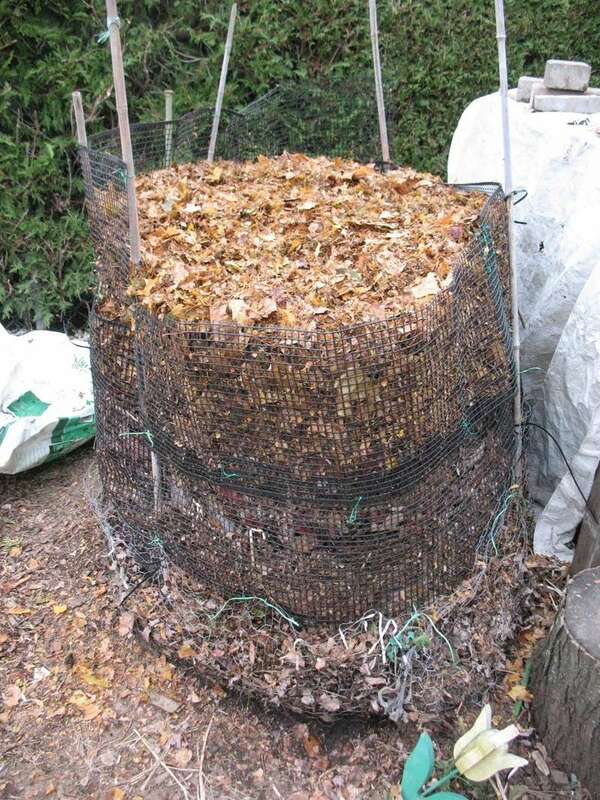 I used some of the mulched leaves to top up compost bins, filled two plastic bins for next year and filled an additional three leaf bags for next year. Love all those mulched leaves! What do you do with the paper bags? Can they be reused? 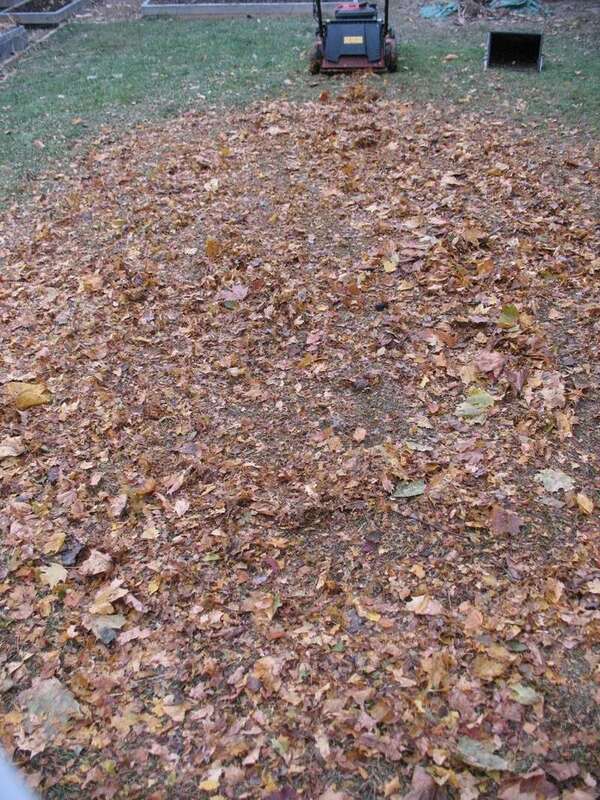 @sanderson wrote: Love all those mulched leaves! What do you do with the paper bags? Can they be reused? Concerning the bags, I fold them up and reuse them. Sometimes I return them to the neighbors and they refill them. Then there are always one or two that get torn badly so I recycle them in the compost or with the city pickup. Nice job, TD! And a big job. You have been BUSY! Around here, many of the trees still have a lot of leaves left on them. Usually, by this time, my big oak tree is the last hold out, but this year has been strange, and many leaves are still hanging on for dear life in my neighborhood and much of the surrounding area. Isn't it nice to have that big job behind you? Another reason to be thankful! Thanks HG. It seems like it is always a mad rush to get things cleaned up in preparation for Winter. I still have to put a "roof" on the Table Top. 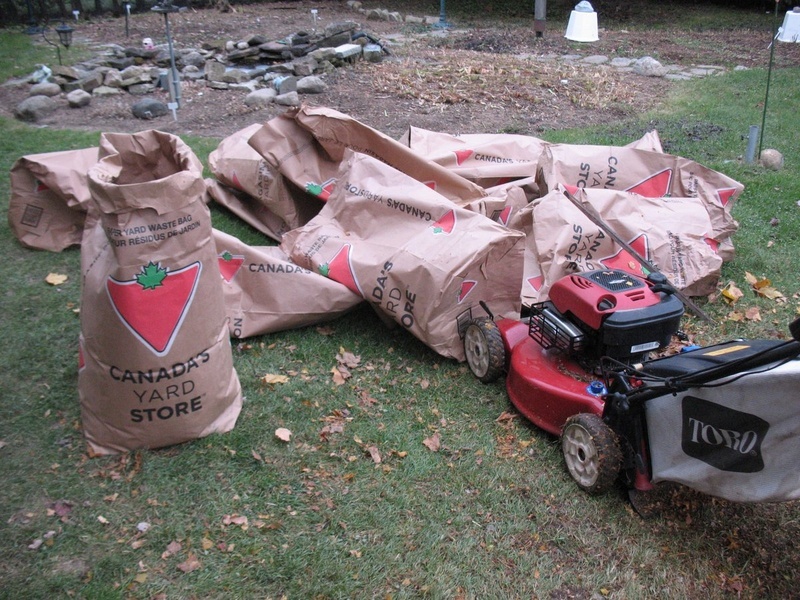 The Fall cleanup gets more difficult each year as my body ages and I work at a slower pace. 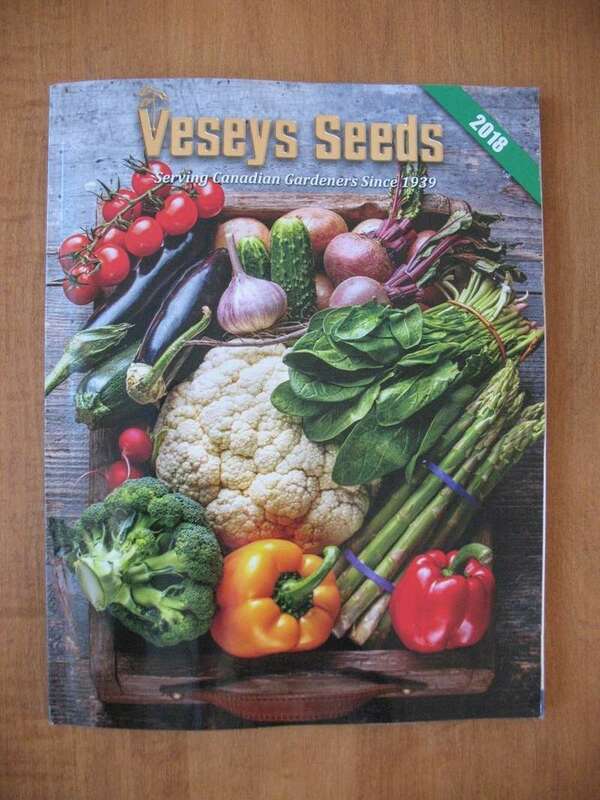 The 2018 Veseys Seeds catalogue arrived yesterday. Veseys is located in Prince Edward Island, Canada and has been in operation since 1939. I'll soon have to decided whether or not I will start a Fourth Year SFG in Canada thread.